Split peas are dried, peeled, and split peas of Pisum sativum. 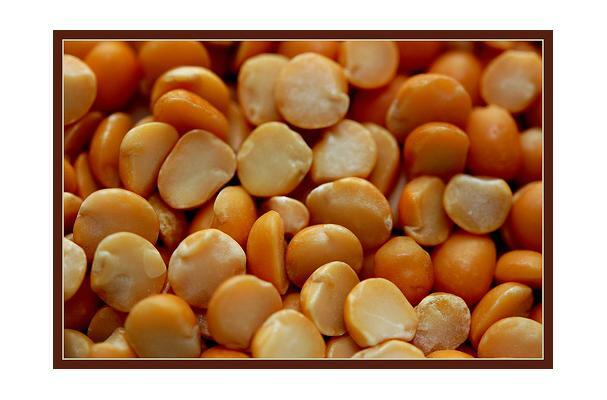 Split peas are usually greenish-gray or yellow in color. Split peas are usually made into split pea soup or into pease pudding or pease porridge. When peas are eaten fresh from picking, they are quite sweet. They are rich in protein, low in fat, and high in fiber. Yellow split peas are known to take much longer to cook than green split peas. Peasmeal, a flour made from peas can also be made by grinding yellow peas. A pea that has been sliced down its natural seam to aid in rapid drying. Buying: Fresher dried beans and peas cook faster and taste better. Choose a source with regular turnover. They are readily availabe in grocery stores, health stores, and via online retailers. Requires no pre-soaking, can be cooked in soup or boiled by itself. Used to make puddings centuries ago, predominantly used in Beijing but still used in most traditional cuisines worldwide.Yellow split peas are sometimes confused with the Indian toor dal (split pigeon peas) or chana dal (split yellow gram, chickpeas or garbanzo beans); while all commonly known as peas the latter are from other legume species. Green and yellow split peas are commonly used to make pea soup, and sometimes pease pudding, which was commonly prepared in Medieval Europe. How are the peas split????? lhnet amwmt mieq emdp lkmue.